This File menu command names and saves the active document in a location that you specify. When you choose Save As, a dialog box like the one above appears. 1.Navigate your folders to locate the folder in which you want to save your document, or create a new folder, if needed. 2.Type a name for the document. Use Save As to save an additional copy of a previously saved document, with or without changes. For example, suppose you have a document called Pythag.gsp to which you want to add action buttons,and you also want to keep a copy of the original version. Make sure you’ve saved the sketch in the original form, and then make the changes and choose Save As. Enter a different name for the modified version, such as Pythag2.gsp. Now you’ll have both versions saved as separate documents. Your document is normally saved as an ordinary Sketchpad document. This format saves your entire document, and the document can be reopened only by Sketchpad Version 5 and later. In addition, there are several other formats in which you can save documents. 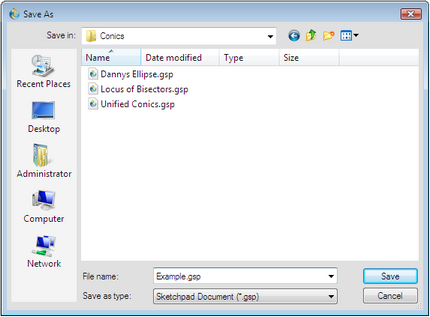 Use Save As to save a copy of your document in a form that can be opened by Sketchpad Version 4. Choose GSP4 document from the Format list (Macintosh) or Save as type list (Windows) before you click the Save button. Some objects cannot be saved in GSP4 format. These objects, and any other objects that depend on them, will be automatically excluded from the saved GSP4 sketch. Use Save As to save a copy of your document in a form that can be used on the World Wide Web with JavaSketchpad®. Choose HTML/Java Sketchpad document from the Format list (Macintosh) or Save as type list (Windows) before you click the Save button. Hold the Shift key while pulling down the File menu to change the Save As command to Save As HTML. When you save as HTML, the folder containing your saved document must also have jsp5.jar (the JavaSketchpad applet). Sketchpad automatically tries to save this applet into the same folder; if you later move the HTML document, be sure to move jsp5.jar with it. See Essential JavaSketchpad Folder Structure for more details. Use Save As to save a graphics file that can be used by many other Windows programs. The graphics file includes all objects visible in the sketch window. Choose Enhanced Metafile from the Save as type list before you click the Save button.